Enjoy a fantastic price on our beautiful hand crafted Beeswax tea light candles. You may find similar candles in the cheap metal tins, but not in the high quality plastic cups we provide! 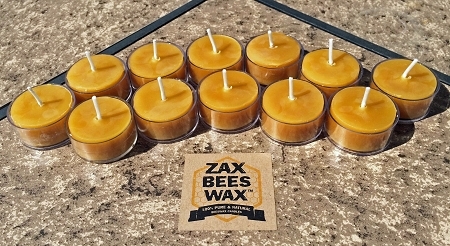 These 100% Pure American Beeswax tea light candles. They candles have a wonderful natural scent that comes from the natural honey the wax contains. We offer these tea light candles scented with Lavender Essential Oil or Creamy Vanilla fragrance oil. Because we purchase beeswax from several family owned apiaries, there may be some fluctuation in beeswax color. The color of beeswax is determined by the type of pollen the bees use, the climate, and the age of the wax. Our traditional beeswax color ranges from a bright yellow to a full golden color. All of our candles are hand poured and made to order. As candles are handmade, there may be some slight variation from the candles shown in picture. Love these, clean burning and feel good about them being natural. Absolutely the best!! !